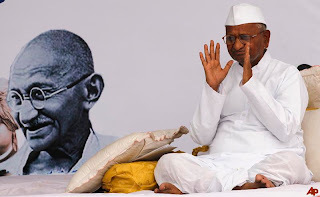 We all wanted something like Anna Hazare’s movement. We all wanted something like that to happen, though none of us wanted to do it ourselves. When none of us knew what to do, he found a way out. There was will, so there was way. I wonder if he took his inspiration from a wrong person like Chandrasekhar Rao the separatist politician. I know I am committing a sin by comparing these two gentlemen who have no commonality whatsoever. I don’t even know if it is fair to call one of them a gentleman. Anyways, my apologies for that! Old is Gold! New is? Two earliest virtues that went into my mind very strongly in childhood are courage and honesty. To put it simple – “don’t fear” and “don’t lie”. But, I did learn later about fearing the fearful and lying for good – like all of you did. “Courage is not the absence of fear but conquering it”, they say. I think, most of our courage is only the absence of fear. Rather, it is the result of our failure to think of the worst – to think of what thoughtless courage could land us in. The courage that we have been having from childhood is also one such thing. We are courageous because we don’t know what would happen if we don’t fear the fearful. We don’t know that fire burns until we experience it first time or see someone else experience it or hear from someone (who has experienced it or seen it or heard it). Eventually we all learn to fear certain things out of experience (for a moment let’s ignore those who don’t do that even after enough experiences). Chief Ministers - Who is the Best? Who is the best chief minister in India? It’s always interesting to talk about top tens, top fives, the bests and the worsts. It makes the job of evaluation easier. Even in appraisals, our bosses rate us based on comparison only, although they say not to compare when we do that and go back to them for justice (!). It makes the analysis interesting and it would help us also identify what makes someone the best or the worst. It’s like reverse engineering. While you identify the best or worst based on few parameters, you also get an opportunity to better understand the parameters that make them so. It also helps us shut up people who give reasons (actually excuses) for not doing something that someone else is able to do in the same role. For example, if someone says it is not at all possible to be a politician and not corrupt when we criticize a corrupt rogue, with this kind of analysis, we can easily show someone who is able to run an able government without being corrupt.